Happy Holiday season! October has passed and now we enter the joys of the holidays. Thanksgiving is a day where we hang out with family, gorge ourselves on delicious food and immediately regret that second helping of sweet potato pie. But what if we told you that sweet potatoes have a crazy amount of benefits? Not only are they delicious, sweet potatoes bring a ton of health benefits to the table. Read on about how sweet potatoes benefit your hair and skin. Have you ever used a sweet potato for a topical use? Well, it’s time to start doubling the amount of sweet potatoes you’re going to boil this Thanksgiving! 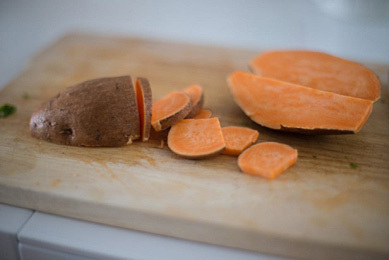 Mashing up boiled sweet potatoes- after they cool, of course- and applying a teaspoon to your face can help oily skin. Leave the mask on for a half hour and rinse off. After you’re done with your mask, why not tone with them too? The water you boiled your potatoes in makes a great toner for your face. Sweet potatoes can absorb impurities in your face while offering a deep clean and soothes any irritation. The reason why these vegetables work so well as topical treatments is because they’re chop full of vitamins and nutrients. Your collagen improves from the Vitamin C inside which is great for elasticity. Cell damage is also repaired thanks to the antioxidants inside. Oh, and you’ll also get some Vitamin E as well which is great for the overall health of your skin. Sweet Potatoes not only make a great face mask, but they work wonders as a hair masque as well. If you have dull, rough hair, mix some mashed sweet potatoes with a little bit of honey, yogurt and olive oil to bring some life and shine back into your locks. Now that we’ve covered the beauty aspects of sweet potatoes, it’s time to talk about the health benefits. There’s a lot of manganese found in these root vegetables which helps your metabolism and blood sugar levels. Remember all that vitamin C we talked about earlier? Well, aside for being amazing for your skin, Vitamin C is also essential in boosting your immune system- just in time too for the winter! Sweet potatoes also carry a fair amount of iron. Iron can help the production of white blood cells which also reduces anemia or the thinning of blood. There are so many ways sweet potatoes can impact your health. From topical treatments to being jam packed with essential nutrients, it’s an amazing food to add to your Thanksgiving menu this holiday season. Oh, and don’t feel bad about going back for seconds.